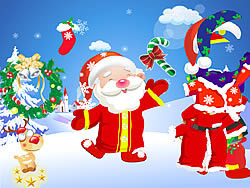 Santa Claus is Coming to Town Game - MyGames.com - Play fun free my games. Santa Claus is coming to town! He's making a list, He's checking it twice, He's gonna find out who's naughty or nice". Now dress him up, then he will send you a special gift on Christmas night.